View More In Accessories - Page 2. An emerging new brand, is intergrated with sales and services, which specializes in Digital thermometer, Computer & Communication & Consumer Electronics accessories and other computer periphery products. In particular, our gaming headset & mouse, via minimalist design and cost-effective by the majority of users love. We have skilled and professinal suppliers. Pursuit excellent quality, providing better service is our eternal commitment.We cherish every cooperative chance to make progress, any advice about JinSun is welcome! 1 × W200 Wireless Gaming Mouse. 1 × USB Charging Cable. 1 × Multilanguage User Manual. 1. Not a Programmable Keys Customized Mouse, So You Can't Adjust DPI Through Third-party Software!!! 2 IN 1 WIRELESS & WIRED GAMING MOUSE - The mouse can be swapped seamlessly from wired to wireless according to your preference. Fast Wireless data transmission; advanced 2.4Ghz wireless technology enables transmission distance can reach up to 10 meters without obstacle. Recharge Quick-connect design allows you to switch from wireless to a data-over-cable connection so you never run out of power. ERGONOMIC DESIGN AND STRONG DURABILITY - Designed by our Japan team with 5 years experience in exterior design, work on it over 6 months to ensure the most comfortable experience, test on it for more than 6000000 times, to ensure stronger durability of the mouse. Helps you relieve the muscular fatigue, it fits naturally in your hand with no cramping after extended gaming or work sessions. Apply skin-like material surface provide unparalleled comfort and unique grip as you working or gaming. 6 ADJUSTABLE DPI WITH CHANGEABLE LED LIGHTS - 6 Adjustable DPI levels (1000-1800-2500-3200-4500-6000) settings to match your gaming needs, makes you can choose your suitable cursor speed and win the battle victory in a game with a quick speed. Widely range of DPI with ZERO smoothing or filtering for consistent responsiveness and control at any speed you need. The Red, Blue, Yellow, Green, Dark Green, Purple changeable breathing LED lights offers you a cool environment for gaming or working. RECHARGEABLE HIGH-CAPACITY BATTERY - Built-in rechargeable battery (1200mA) with a 48in (1.2m) charging cable, takes roughly 8 hours to reach a full charge. One time charging, sustainable use for 500 hours. The longest-lasting wireless gaming mouse can help you more outstanding once you are gaming. 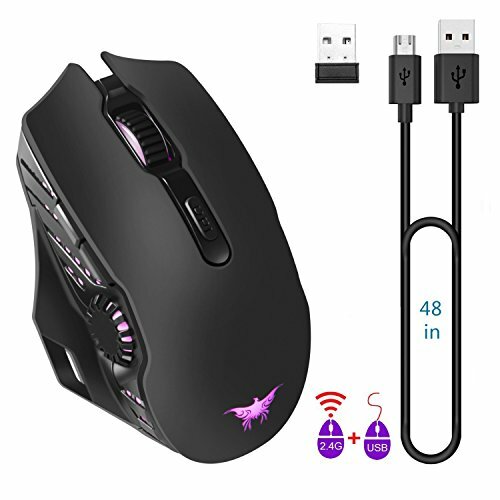 EASY INSTALLATION - The gaming mouse is intelligent connectivity, no need to code or software; CD driver, simply plug & play. Perfectly compatible with windows 2000/ME/XP(X64)/Vista/7/8, Mac OS (above V10.4). If you have any questions about this product by JinSun, contact us by completing and submitting the form below. If you are looking for a specif part number, please include it with your message.